What Are the Forms for a Last Will & Testament? At common law, testators prepared a will to pass real property and a separate testament to pass personal property. Modern statutes do not distinguish between the terms. A last will and testament is a single document describing your property and who you wish to inherit it at your death. States do not mandate the use of any particular will form as long as the testator's will includes all elements required by each state's laws. A last will and testament identifies the person making the will, usually by full name, address and phone number. Typical will language states that the testator is of legal age and sound mind, but this verbiage is superfluous. The court makes an independent determination of legal age -- in most states 18 years old -- and presumes that an adult is of sound mind. Anyone challenging mental capacity bears the burden of proof. A will's primary purpose is to identify the testator's heirs. If a testator leaves everything to one heir or several heirs in percentage shares, she need not describe her property. A will bequeathing particular items of property to specific heirs identifies the heirs by full name and address. It also describes each item of property sufficiently to facilitate identification. Will language can condition bequests upon the heir outliving the testator; if it does so, the testator names alternate beneficiaries to receive the property if the condition fails. Executors administer last wills through the probate process, collecting assets, locating heirs and liquidating property. 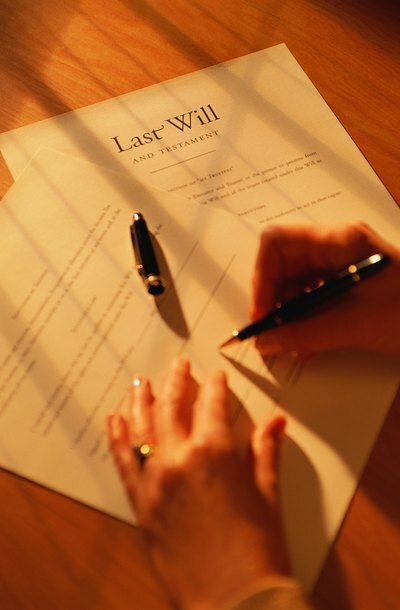 Many testators appoint executors in last wills, but this is not necessary for will validity. The court appoints someone to administer the will if no executor is named. Similarly, probate statutes do not mandate parents to nominate guardians for minor children in their wills, though wills commonly name both a guardian to care for the children and a separate financial guardian to handle their money until they reach the age of majority. The court appoints a guardian if no guardians are named in the will. A will must be signed according to state procedures, termed "executing" the will. Most states require that the testator tell two adults that the document is her will, then sign it before them. Each witness also signs the will. In probate court, the witnesses prove the will by describing the testator's actions. Some courts invalidate the will if the witnesses are also heirs. Those states permitting holographic wills, or wills written entirely in the testator's handwriting, dispense with the witness requirements.